It is suitable for capsule, tablet, big honey pill, candy, syringe, one injector, liquid, ointment, paste as well as irregular shape Al-plastic, paper-plastic composite sealing packing in pharmacy, healthcare, food, cosmetics, medical equipment industry etc. This Model Flat Plate Automatic Blister Packing Machine is a high-tech packing machine for aluminum-plastic, paper-plastic packing. It is adopting PLC, frequency converter and man-machine interface with features of all round function, ease for operation, stable running, qualified with GMP. Because of its large forming area and more plates per cutting (standard sheet: 5 plates once), to a certain extent, it meets the needs of enterprises that have scale output, especially for candy and milk tablet etc packing in the food industry. The products have been appraised as the provincial science and technology accomplishments. Manipulator towing, adjustable travel range, which can fit for blister packing of different sizes. Without altering the circumstances of cam lift, it adopted culms double pendulum device, thus increasing the traction travel (it can be reached as long as 200mm). All the movement of heating, forming, upper and lower net veins pressing, air cylinder pressing, feeding, lot number printing and cutting can be done very simple, automatically and accurately. 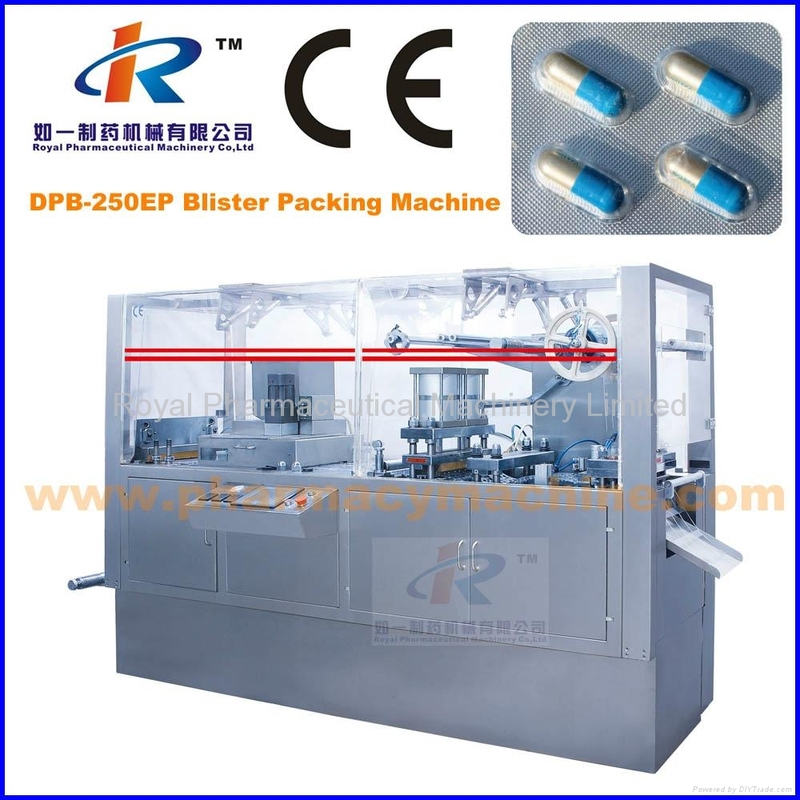 Positive pressure forming matched with mechanical punch ensures well blister forming, and can be collocated with special automatic feeder to fit for certain packing such as ampoule, vial, syringe, big honey pill, medical appliance or other special shapes. Main transmission part adopts parallel axis and bevel wheel speed reducer, forming heat-sealing and impressing moulds adopt bolt orientating which leads to precise, orientation, easy to change moulds and material saving. Detachable design makes the machine can be easy to be carried and installed according to user’s requirement.